We have this exact car seat and it's amazing! Best of luck to everyone who enters! The cooler weather has arrived and families are gearing up for holiday travel. Diana from Nanny to Mommy recently shared her review of the award winning Diono Radian RXT Convertible + Booster Car Seat. - With the features on the Diono seats, heavy means safe. And heavy is good. VERY good. Safety is a top priority when it comes to road trips, and that's why we're excited to offer a giveaway for my favorite car seat, the Diono Radian RXT Convertible + Booster Car Seat. 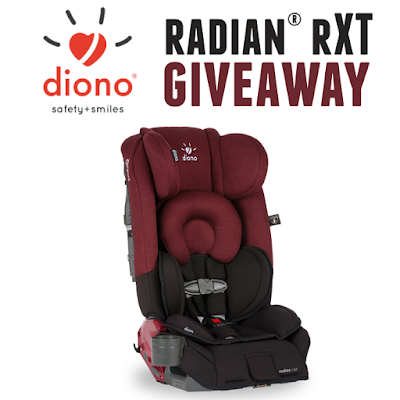 One lucky Nanny to Mommy reader will win a Diono Radian rXT all-in-one convertible car seat! Entry is simple, just follow the prompts on the Rafflecopter below. Open US only, must be 18+ to enter. Winner chosen via Random.org through Rafflecopter. All winning entries are verified. Please follow us on Facebook to stay up to date with our current giveaways. Good luck! Nanny to Mommy and all participating blogs are not held responsible for sponsors who fail to fulfill their prize obligations. This contest will run through October 3, 2017 at 11:59 EST. No purchase necessary. US entries only. Must be 18 years or older to win. This promotion is in no way sponsored, endorsed, or administered by or associated with, Facebook. You understand that you are providing your information to Nanny to Mommy and not to Facebook. We have represented each sponsor with the expectation they will fulfill their prize in a timely manner. We will contact the sponsor regarding your prize(s). The sponsors, in most cases, are shipping their items to you directly. I will make every effort to assist you obtaining your prize. If there is an issue with a sponsor, please notify the blog you won a prize from within 4-6 weeks for assistance, after that we may be unable to assist you.